This information was developed by the National Eye Institute to help patients and their families search for general information about astigmatism. An eye care professional who has examined the patient’s eyes and is familiar with his or her medical history is the best person to answer specific questions. 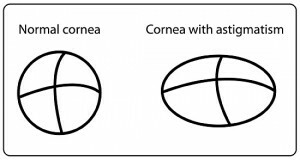 It is possible to have mild astigmatism and not know about it. This is especially true for children, who are not aware of their vision being other than normal. Some adults may also have mild astigmatism without any symptoms. It’s important to have comprehensive dilated eye exams to make sure you are seeing your best.